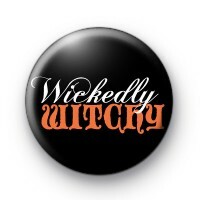 Spooky Wickedly Witch Badge in black with wickedly witchy written across it in a white and orange witchy font. One of our more popular Halloween badges & a great badge for those of you dressing as a wicked witch or black cat this Halloween. Standard 25mm button badge made by hand in our family run workshop. We have a huge range of Halloween badges available on the website. They look great pinned to your uniform or Halloween costume and are great to give out on Halloween. We deliver our badges worldwide and offer free worldwide delivery on larger orders.